Lakehouse Live was created by CJ Dridsom and Musiq Haus to present high quality music from Utah and around the country. The kickoff event started with New York based jazz harpist, Brandee Younger, followed by SLC's very own Izzy Smith. 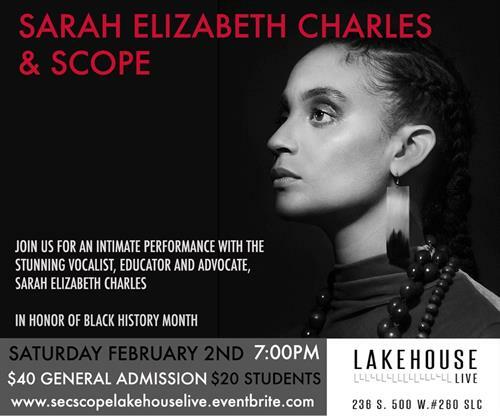 In February, Lakehouse Live does it again with a celebration of Black History Month with Sarah Elizabeth Charles & SCOPE. "Sarah Elizabeth Charles is a vocalist on the rise, riding the momentum of two phenomenal previous releases: 2012’s RED and 2015’s Inner Dialogue. Those projects wedded Charles’ acute melodic sensibility to her incisive sociopolitical analysis, and on her latest release, Free Of Form, she strengthens those connections even more." Sarah Elizabeth Charles has performed in The White House, Carnegie Hall, the first annual Culture Summit in Abu Dhabi, The Kennedy Center, the Bern International Jazz Festival in Switzerland, the Port-au-Prince International Jazz Festival, the Sicca Jazz Festival in Tunisia, the Blue Note in New York City, Gillette Stadium as a National Anthem singer for the New England Patriots, the Pittsburgh JazzLive International Festival, the Burlington Jazz Festival, the Apollo Music Café, Le Poisson Rouge, Dizzy’s Club Coca-Cola, the Rose Theatre with Jazz at Lincoln Center and many more. She has also had a commissioned composition performed at The National Gallery in Washington D.C. via The Canales Project "Hear Her Song" initiative. Sarah is performing a repertiore honoring Black History Month with new music featuring Maya Angelou's poetry and original music she composed along with other originals that will surely move you. Keeping the celebration going, we invite you to spend an intimate evening with us at the growing Lakehouse Studios in downtown Salt Lake City. We look forward to seeing you!